Just thought I'd run this project idea past you. It's not specifically a question, just a set of "what if" type thoughts, that I'd be grateful for your opinions and suggestions on. First of all about me.... I'm not a total electronics noob, but I'm no expert in the subject either. I'm a self taught musician with engineering and some software skills, and I'm currently pretty broke, which is what made me seek out solutions and what led me to find the Midibox Project in the first place. I fell in love with the Sequential Circuits Prophet 5, back in the 80's.... But I've never been able to afford one. Even more so now that they cost WAY too much as collectors items. Even if I did afford one, vintage synths are unreliable and unstable at the best of times. Here's the components I'm thinking of using... Midibox 64E... Plus enough input boards to give me all the pots and switches (in this case rotary controls and switches) of the original synth... plus a few extras... LCD display instead of the LED display on the original synth. Inside the replica Prophet 5 case, will be buried a Mini ITX Motherboard to run the software synth (not entirely decided which of the available software emulations to run yet), with a good sound card plugged into it, to give good quality audio output... Plus all the Midibox parts to run the front panel. I figure, use rotary controls rather than pots, so that whatever patch I set the software synth into, the front panel will immediately mimic the correct positions of the controls. Now... this is the point where I run into snags... Obviously the keyboard of this synth has to be functional (it's not just a midi expander module) So I figure that either I have to use a second Midibox Core to handle the input from the switches on all the keys (the original synth was not velocity sensitive so switch on or off inputs would work fine as a key interface), or I have to bury the guts of a cheap MIDI synth inside to provide the key input in midi form that can then be fed to the Midibox hardware and merged with the front panel controls before being sent to the Mini ITX PC Board for the emulation to deal with... Any thoughts you guys have on this would be useful. in answer to your question , yes its a doable project and the mb64e will suit your needs. the buttons can be bought cheaply from ebay, i know there is one seller in hong kong doing good deals on the same style buttons. you will find replica knobs on ebay also. the front panel would have to be cnc laser cut as i dont think schaffer do them that size, although i may be wrong. the front panel can then be either silkscreened or can be laid out using lazertrans and as the printer does not print white you coule have grey lines for the panel seperators instead of white. you then need a keyboard from somewhere, prehaps buy a cheap yamaha portasound keyboard or something similar from ebay thats not going to cost much second hand and that you can take apart..
then you need to work out the case work also. the other alternative is to not have a casework and just the top controller section and just connect a little midi control keyboard to it. there is loads of information nad help to be gathered on the forums here, one thing we always state to anyone is read,read,read. it doesn't matter how competent you are as there will always be something to slip you up on the way. myself i have been looking at rob papens predator soft synth and making a hadware controller for that at some point. at the moment im 2/3rds done on my bpm controller, you can read up on it in the design concepts section of the forum. have a good read of the site, you will find other members who have managed to bolt on keyboards to cores for using with stuff they have built, dont be afraid to ask questions. Thanks for the welcome and thanks for the quick reply. The only real quandry I'm in is over the keyboard. I do have a few MIDI keyboards but non I want to rip apart right now. So I'll give it some thought and as you say read read read... :D If I go the rip a keyboard apart route then I may well follow your suggestion of hunt on ebay for somthing that outputs MIDI. I do have a lot of spare parts lurking and have some physical keyboard hardware laying about with no electronics so it might be cheaper to try and press some of those parts into service. Thanks for the tip on the switches... just need to track down some cheap rotary encoders now. The case and hardware part of the project is no real problem. The front panel and all the woodwork I can cut on the 3 axis CNC machine I built, so that shouldn't be any problem. Not really keen on making it an expander... So I have to figure out the best route to get the keyboard functional. Either as we say, rip apart a cheap Yamaha or similar, or figure out how to use a Midibox Core as a keyboard switch to MIDI encoder. If I get stuck with the front panel controls and can't find the answers in here then I'll be sure to ask. I've no doubt it's all been done before. It's just combining what other people have done to make it function. The way I'd do it re: the keyboard is to get a cheapy MIDI KB, something like an old Evolution one. I've got a Commodore branded one made by Evolution that would be perfect and no, you can't have it :-P. The keys are a little undersized admittedly but it's lightweight and easy to rip apart. - You will also need to have a monitor, keyboard and mouse connected to start the emulation, take care of windows, updates and such. Thank you for your thoughts guys! They do indeed help me to resolve the directions I need to go in. You could also just build a MB64E with same layout as the synth and hook it up to your DAW via MIDI.. Agreed I could do that.... and in practical space terms that would probably be the best way to go. Noted and agreed... I should still be able to do that even with all the hardware around it. 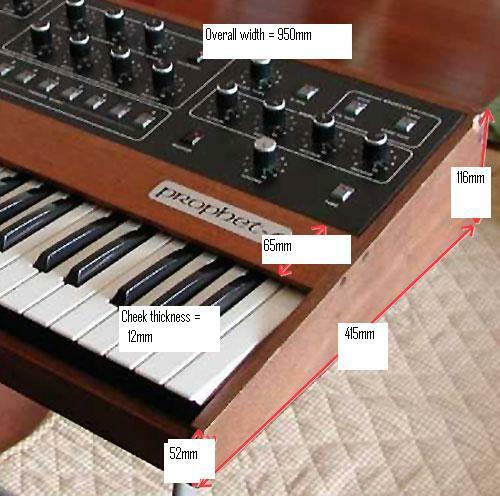 The idea being that it works as a stand alone synth, but also has MIDI in out access to the outside world. Agreed... and latency may become an issue with this setup. That's something I might have to work around. Again agreed. 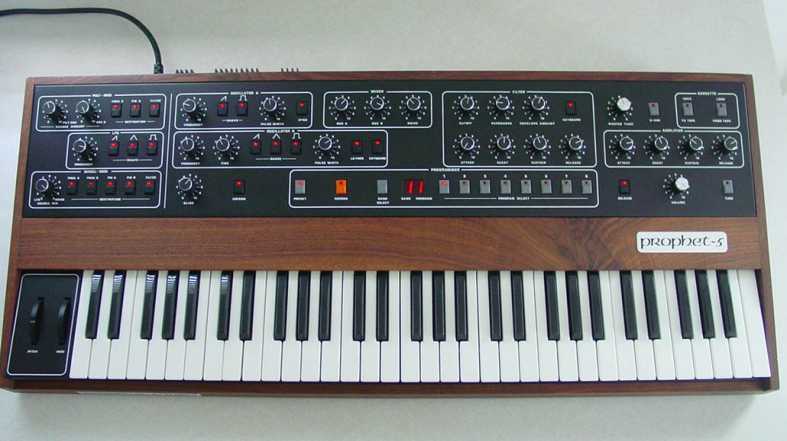 But in this case it's not an issue for me as the objective is to replicate the external appearance of the original synth as well as increased functionality internally. studio space isn't really something that bothers me much to be honest. Very true... and what I may well do is to build another MidiBox project that is in itself a generic softsynth control surface. That's certainly a project I'll want to do later. I'm not really after that sort of flexibility with this one, just want to make it function as a synth in itself. I suppose that you could also say that about the Midibox FM or the Midibox SID projects. Yes.... I will be including the monitor mouse and keyboard ports on the back panel. But once it's setup it'll be designed to auto boot right into the chosen configuration with the software synth running. So 99% of the time, I won't need to connect them. Yes that is an issue.... But it's one I think I can work around in the software. The Mini ITX board itself shouldn't be a problem, for one thing it's fan-less and designed to run in poor environments like in a Car PC. I'm also planning on running a Flash Card, instead of a Hard Drive. So that Means that there are no mechanical parts to break down. The only time I should need to connect a DVD Rom is for initial set-up of the system and drivers. So once it's in and running it should be pretty reliable. Thanks!! :D I think I need it with this one! LOL :frantics: I do very much appreciate your thoughts on this. They have driven me to justify how I'm doing it, which is very useful to me. As the proud owner of a Prophet 5, mine is very reliable, and I take mine gigging and use it daily. It's easily the coolest synth out there. I would be really concerned with latency more than anything.. even 10ms starts making something sound sloppy... It's the whole immediacy thing, like you hit the key and the sound happens. even if it's tiny, that delay starts to make an instrument feel sloppy and lazy. What about the creamware rack version? you could pick that up S/H for a decent amount now. Hey! Thanks SineSurfer... It's nice to see a few people have an interest in what I'm trying to achieve. As a completely green with envy non Prophet 5 owner I can only agree that it's possibly one of the coolest pieces of kit on the planet. Cutting up a second hand midi keyboard is no big deal.. I've done it on about 3 different projects..
Yeah! I think that's the route I'm going, I've just spotted a Yamaha PSR for sale for very few sheckles locally. Sweet Deal!! I picked up my Maplin 5600S in swap for some software. I think that's probably my best deal to date. Agreed!! That's something I really need to keep tabs on with this project. Having played a Prophet 5 back in the 80's, I know what an astoundingly good response they have in comparison to other keyboards from the same period. So I have to get the same or similar results, or it'll just feel wrong. I did look at those... They're selling new for about Â£900 in the UK. I don't see them come up for sale second user very often over here. Even so I'm one of those people that derives as much pleasure from building something as I do from using it, so I really want to go the build it myself route. WOW!!! That would be astounding!! What a great addition to the project. As I said though, I'm in the UK.. South West Cornwall to be exact. So I don't know what the postage costs on something like that would work out at. It might be a bit of a killer mate! Worth investigating though. Because one of the things I'm struggling with is accurate case dimensions. None of the manuals or service manuals has dimensioned drawing in them. I don't think Sequential ever published a set of accurate dimensions for the case parts. So yes! I'd be interested in a front panel and any other parts people can help out with. HKSS often does great deals for bigger buys, so ask em if how much for x amount. These, however are NOT the same switches as used in a Prophet 5.. actually, these are the same as used in many Oberheim Synths.. I've bought plenty of these in the past, and used em for quite a few projects, including a midibox Seq. these switches I'm not 100% sure if they are the correct dimensions.. but they look right. Thanks for the links! I suspect that they might both be the same size as they're both listing the panel cutout as being 12.6mm wide. They sound more like Oberheim switches to me as well. Not sure of the exact switch size, but they sound a little bit too wide. Could you do me a favour Mate and measure what the actual panel cutout size is on your front panel please. That would tell us if they are the right ones. I do know that a company called "Powertran" used to use them as well... They used to make a couple of rack synth and reverb module kits back in the 80's and were UK or AU based, but went out of business some time ago. Prophet 5 switches are the Same dims as the second link..
Digging around in my junk pile in the garage... I've dug out an ORLA DMK7 Midi controler keyboard. The electronics on this screwed the pooch a long time ago (early 1990's I think). The backlight would come on but the main board showed no signs of life. I powered it up today to see what was happening and one of the bead caps on the PSU exploded unceremoniously. Unfortunately, they're completely unmarked as to their value, and I really can't be bothered getting the ESR meter out to find out what the similar ones on the board are rated at, or what else that might have fried in the process. 1) A nice weighted and sprung 61 note full size keyboard.. Ideal!! Not only that but it's of the best variety, being a proper bus bar keyboard and not one of those garbage rubber switch types. Very easy to solder all the new connections to. The keyboard itself is screwed to the case and has a good solid metal frame, and hinges to lift it for servicing. 2) A nice set of pitch and mod wheels which look almost identical visually to the Prophet ones. So I should have no trouble connecting the pots from those to the core (replacing the pots if necessary) and then fitting them in a new metal panel to the left of the keyboard. 3) A lot of salvageable chips that all appear to be nicely socketed. (they'll go straight in the spares box). NOW! Here's the plan.... I figure it'll cost me no more to buy an extra Core Module than it will to buy a cheapo midi keyboard to gut as a controler... Plus it means that it's then programable. I figure that connecting the keyboard keys to switch inputs on the core will easily allow me to connect 61 Notes up as button inputs and have them transmit the correct MIDI note number and note off when they're released. Given that the core can scan the state of all connected buttons every 1ms the response time should be very good indeed! Then take the MIDI output from that Core and feed it to the MIDI input of the second core, with the merge on, and the second core should handle all of the Rotary Encoders and buttons on the front panel. It does mean that I have to write some of my own software, but hey! so what, the examples of how to read buttons in the OS are there for all to find. So it should work! If anybody sees any major problems with that plan do let me know. What I need now is some help with the dimensions for the new case Mike, I was wondering if you possibly have time to do that for me. I've attached a couple of pictures of the dimensions I desperately need... Everything else I can work out from that. If you have time to do that for me I'd really appreciate your help. The cap that exploded was prob a tantalum cap, they often fail with age.. going short circuit, then going up in smoke. Quite a few things that I've gotten broken and fixed were due to tantalum caps dying.. I'm not 100% sure that the whole core + keyboard is a good idea.. I still think getting a S/H controller is still going to be cheaper and simpler. The rubber contacts have given me grief in the past, but only on old keyboards (Emulator II & PolySix) and on new keyboards that have had drinks spilt on them. 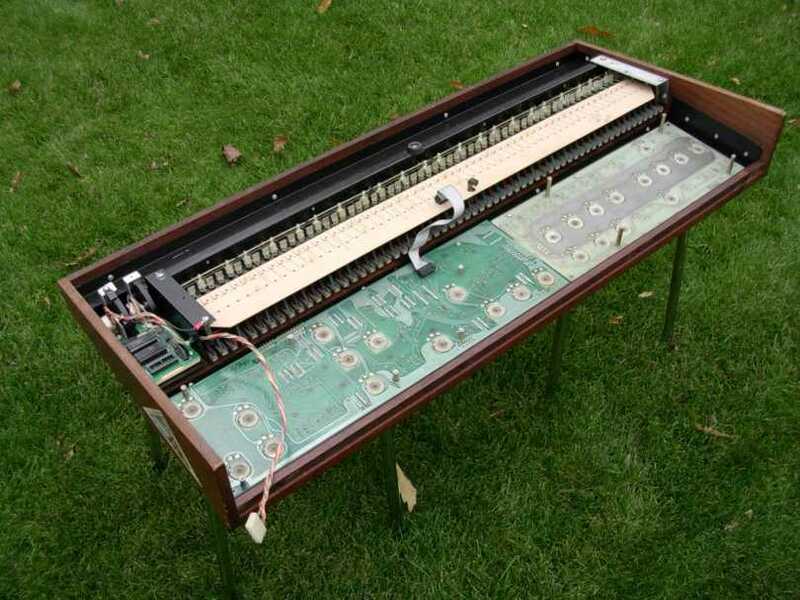 but even then, taking the keyboard apart, and removing the rubber contacts and washing them, then cleaning the pcb under them has always fixed up the issues for me. Bus bar keyboards also have their issues to (contacts bouncing, causing double notes) and the only 100% proof way i've found of fixing them is to use silver conductive grease. A tiny smear on the contacts works wonders, and 2 years after doing it to my Emulator 1, I've never had a bounced note. Also, it sounds that it might be tricky to implement velocity on your keyboard.. and while the P5 is not velocity sensitive, it'd be nice to have the option. I more or less agree with you... But I look at it this way, that, if it doesn't work out, I've then got another core module to use in another project. As far as rubber keyboard switches go, I've repaired quite a few of them. They do wear and like you say, having things spilled in them is a disaster... The last one I repaired was back in October, when I acquired a Roland D5 for Â£3 because some of the keys didn't work! That one had had something spilled in it and the tracks corroded. Easy fix with a bit of conductive paint. But they're impossible when you need to solder anything to them. True enough... The one on my Moog Rogue is a pain in the rear for doing that no matter how many times it's cleaned or greased. But that has J wires on it. This one uses flexible springs instead of wires and the action is very positive. Also, it sounds that it might be tricky to implement velocity on your keyboard.. It has got a double bus bar on it, so technically it's possible, but the programming for that might be tricky. I'm happy with not having velocity sensing on this project though. If I do need it, then it's always available over MIDI and I can always control the synth from my Master Keyboard. Thanks a million for the dimensions!!! You made my day Bud!! I can get on with the woodwork now. :D Cheers!!! True enough... The one on my Moog Rogue is a pain in the rear for doing that no matter how many times it's cleaned or greased. But that has J wires on it. Have you desoldered, and rotated the buss bar on the Rogue? No I haven't tried that. I'll give it a go!! Thanks for the tip! Thanks Mike, I think I need it... I've been laying it up in Google Sketchup today Just so I can get a handle on how it's assembled. I've got something wrong at the moment, but I'm not sure where the error is. and I've laid in the wood panel behind that, but the space between that and the case back panel appears to be too large for the control panel by about 20mm or more... Sorry to be asking again Mike, but I wonder if you could give me the measurement of just the metal control panel from front to back please. I wonder if you could give me the measurement of just the metal control panel from front to back please. Cheers Mike! That's exactly the dimension I calculated it at, so that that kind of confirms things for me. Here's a perspective corrected photograph... All the dimensions that you've given me fit it perfectly. Except for the total front to back measurement, which I get to 395mm on the longest edge (top) of the end cheek... It all fits at that. This is why I was struggling with the 415mm measurement you gave me on the case photograph. It seems that it's that one that's out by a bit. Thanks again for all your help! I can work everything on the dimensions from what I have now. I'll try and post the a pic of the Sketchup model later. Ah.. thats because the back is not parallel to the front edge! The P5 has a bit of an agressive wedge shape. The back side (with the big heatsink & audio sockets) is at a right angle to the face (With the knobs) , where the front (Thin leading edge) is at a right angle to the base (The bit that sits on the floor). AHHHHH!! OK!! Now I got it.... You know, that no matter how many photographs I looked at that isn't immediately obvious on it. Now I know that, I'll go adjust the model to match. Thanks again! Now I know this... I can see it in this picture as well! Had you not explained that one I never would have noticed it.... But the angle at the back is very clear here. Only obvious now, because the machine in the photograph is upside down with the base pan removed. Makes complete sense now and yes it goes together nicely in the sketchup model. All the dimensions fit! Cheers Bud!! Beers are on me if we're ever on the same continent. OK Chaps!! Time to take the plunge and order the electronics..... This is how I figure it should work, If anybody can spot anything I missed out or anything else I need to do then I'd appreciate the feedback. The functions required for this are quite simple and the software examples here give all the info necessary to write it. Including note on note off for each key plus de-bounce code which is already part of MIOS. I already write Visual Basic and the C Code seems to be very similar, so I shouldn't have any trouble with that. 2 X DIN Modules to handle input from the switches on 61 keyboard keys and + 2 buttons to set + or - for which MIDI Channel it's transmitting on. 1 X AIN Module to handle Pitch and Mod wheels, plus a couple of inputs for external volume and mod pedals. MIDI IN routed from synth rear panel with merge on. MIDI OUT routed to Panel Controller Section. 2 X DIN Modules to handle 37 panel push buttons + 8 64E Menu Buttons. 1 X DOUT Module to handle 32 LED Lights on buttons. 1 X 2X16 LED Module (backlit Red letters on Black background) for 64E Display. MIDI OUT to Synth Section. Mini ITX Motherboard running a Flash Card instead of a hard drive, with XP and "NI Pro53" + "Arturia ProphetV" Which should give lots of sound options. Monitor, Mouse, Keyboard, ports routed to synth rear panel. 24Bit Sound Card, With Midi IO... and audio inputs/outputs routed to standard 1/4" rear panel instrument jacks. MIDI IN from Panel Controler Section. MIDI OUT routed to Rear Panel of synth. I'll start ordering the parts shortly. So if the above works out, then It's all good to go. As I said, any final input over anything I missed, before I place the parts orders, would be appreciated. I'm still thinking you should get the PC and software running & get a controller and take it for a spin to see how it handles before you fork out $$ on other bits. It's gonna be no good if the latency is poor. Have you done a cost breakdown? Still not sold on a S/H controller? I respect your choice, but it would not be mine. What about a midi merge to merge outside midi with the keyboard going into to the PC? I've heard about people doing it via the can bus I think.. you might need to research that. 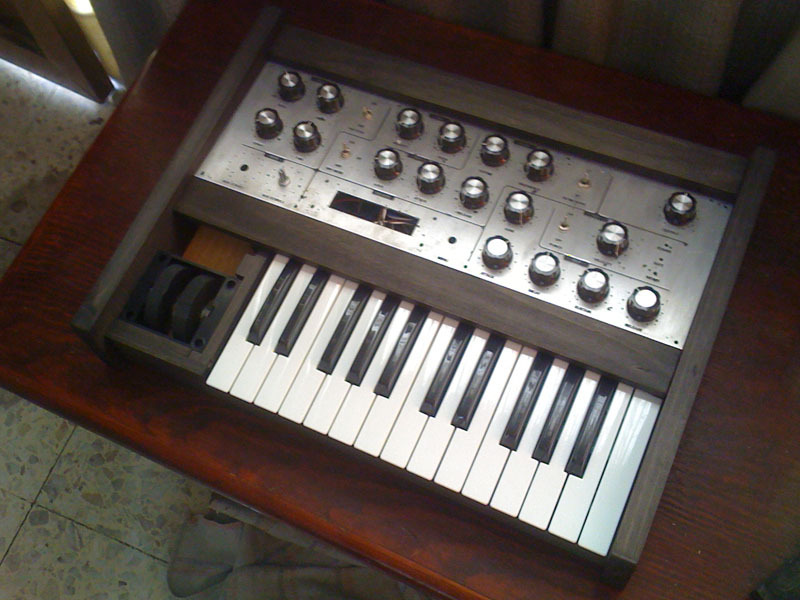 For my Minimoog restoration (Had no keyboard when i got it, so put in a midi'd keyboard with midi-CV) and big SID synth (MB6582 with keyboard) i used midi merge's.